What would you say if I told you there was a naturally gluten and GMO-free whole grain that was high in fiber and phytochemicals with the potential to significantly impact human health, that could be grown cheaply in drought-ridden areas with less water and fertilizers than other crops? You would think it sounds too good to be true. But this wonder grain really does exist. It is called Sorghum and it is starting to make its way onto our tables here in the United States. Sorghum, or Milo as it is also known, is a naturally gluten-free grain that originated in the plains of Africa. It is drought-resistant, making it an increasingly popular crop in parts of the United States hit by drought. It can be eaten as a whole grain, popped like popcorn, or used as flour in baked goods. Because of its neutral flavor, sorghum flour makes an excellent substitute for wheat flour in cookies, cakes, brownies, breads, pizza dough, pancakes, and waffles. As a whole grain it makes an excellent substitute for rice, quinoa, barley, or any other grain in a pilaf, risotto, soup, or casserole. Sorghum is already a staple food in Africa, India, China, Australia, and Central America. In the United States, however, it is still used primarily as livestock feed or biofuel. But that is beginning to change and there are many excellent reasons why. 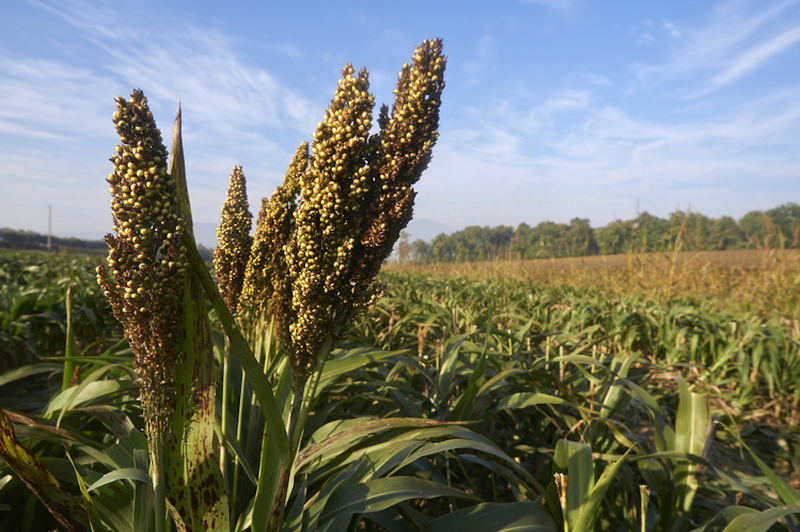 Sorghum is naturally gluten-free. Clinical testing has confirmed that it produces no symptoms in people with celiac disease. Sorghum is high in fiber, protein, and iron. One cup of whole sorghum grain contains 13 grams of fiber, 20 grams of protein, and almost 50% of your daily iron needs. While that is comparable to the nutrient content of quinoa, it is far higher than brown rice that contains just 7 grams of fiber and 14 grams of protein in one cup. One cup of whole sorghum flour contains 8 grams of fiber and 10 grams of protein. Studies have shown that the phytochemicals in sorghum could significantly impact human health, and may reduce the risk of certain cancers and promote heart health. 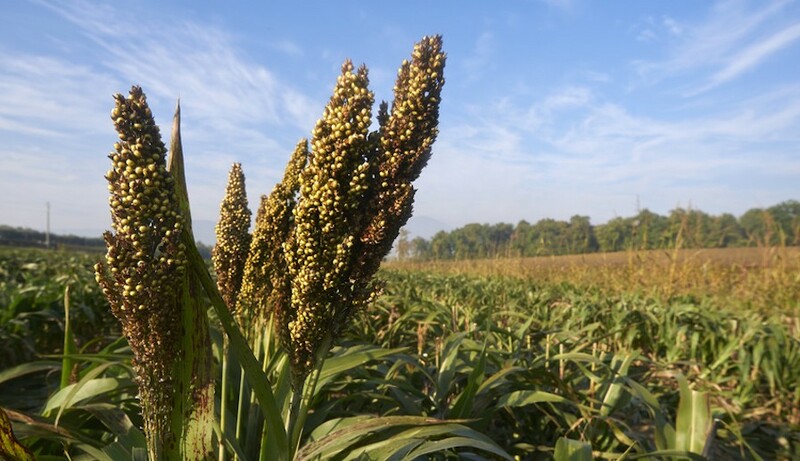 In particular, Sorghum has been associated with inhibiting cancer tumor growth, protecting against diabetes and insulin resistance, helping to manage cholesterol, and helping treat melanoma. Sorghum requires far less water to grow than many other crops. One acre of sorghum needs one third less water than the same area of corn, and fewer fertilizers – excellent news for the environment. All sorghum is GMO-free because it is grown from traditional hybrid seeds and contains no traits obtained via biotechnology. Sorghum is far cheaper than many other grains, especially its nutritional equivalent quinoa. For all these reasons, Sorghum is becoming increasingly popular in the United States. So next time you are at the supermarket, why not buy some of this wonderful grain and give it a try? I will be posting some healthy sorghum recipes on the blog soon. In the meantime, Erin over at Naturally Ella has some delicious sorghum recipes. Great thought! Love tall the healthy facts of sorghum. Thanks for sharing! Hi Alex. Thank you for your great suggestion. I was going to wait until I posted my own sorghum recipes, but you’re right that links would be useful. I’ve added a link to some great Sorghum recipes at Naturally Ella. Where do you buy it? Bulk bins? I tried to buy some for a popcorn substitute and its out of stock everywhere online. Thanks! great article. Hi Katie. Thank you for your comment. Because it is a little tricky to find in stores, I buy it online. You can order it from Lucky Vitamin here http://tinyurl.com/pfsvkug. I plan on finding a good local bulk bin option though.